Merchants Bank and The First National Bank of Northfield have reached a definitive agreement for Merchants to acquire the Northfield banking institution, according to Gregory M. Evans, President & CEO of Merchants Financial Group, Inc. and Merchants Bank, N.A. The agreement is subject to regulatory agency approval, but it is fully expected that the deal will close before year-end 2019. Both First National Bank and Merchants Bank have rich histories of service in their respective communities in southeastern Minnesota. First National was chartered in Northfield in 1873, and Merchants’history began in Winona in 1875. The First National Bank of Northfield has $207 million in assets, $157 million in loans (plus an additional $60 million in sold loan participations) and $183 million in deposits. Internationally recognized as the bank that defeated Jesse James in 1876, First National Bank operates out of two branches in Northfield and a loan production office in Minneapolis. Under the terms of the agreement, Merchants Financial Group, Inc. will acquire all of the outstanding stock of The First National Bank of Northfield in an all cash transaction. The amount of the sale was not disclosed. Merchants Bank is a full service community bank with 21 branches in southeastern Minnesota and west-central Wisconsin. Headquartered in Winona, MN, the Bank is the fifth-largest banking organization headquartered in the state of Minnesota with more than $1.76 billion in assets. Merchants Financial Group, Inc. (MFGI) announced first quarter net income of just over $3,470,000 according to MFGI President & CEO Gregory M. Evans. “We are on target for a strong 2019 and we’re pleased with both our financial results and progress on key strategic initiatives,” said Evans. As a result of continued profitable performance, the MFGI Board of Directors authorized a semiannual dividend of 70 cents per share to shareholders during its April meeting. Dividends will be paid in June to shareholders of record as of May 17. Net income is ahead of MFGI’s plan for 2019 by $442,818, but is behind performance of a year ago by $476,827. One impact on year-over-year earnings was a necessary contribution of an additional $240,000 in loan loss reserve put aside to cushion against possible future loan stress. Contributing to the overall positive first quarter performance, three of the Bank’s four regions exceeded their 2019 first quarter plans. Additionally, MFGI saw year-over-year growth in total loans of $80 million and total deposits of $53.2 million. The ownership of Merchants Financial Group is made up of its more than 440 employees and its shareholders, mostly individuals and families from southeastern Minnesota and west-central Wisconsin. Merchants Bank is a full service community bank with 21 branches in southeastern Minnesota and west-central Wisconsin. Headquartered in Winona, MN, the Bank has more than $1.76 billion in assets and was founded in 1875. Your business is constantly changing. When was the last time you reviewed your business accounts to ensure the best return and most efficient cash flow? Ask the questions below about your current account(s) to reveal unnecessary spending, maximize your earnings and improve efficiency and security. If you’ve answered yes or maybe to even one of these questions, you may be thinking, “I wish a professional could take a look at this for me.” We’d be happy to! We can provide a free, no-obligation account analysis. Just contact a Treasury Management Specialist to get started. 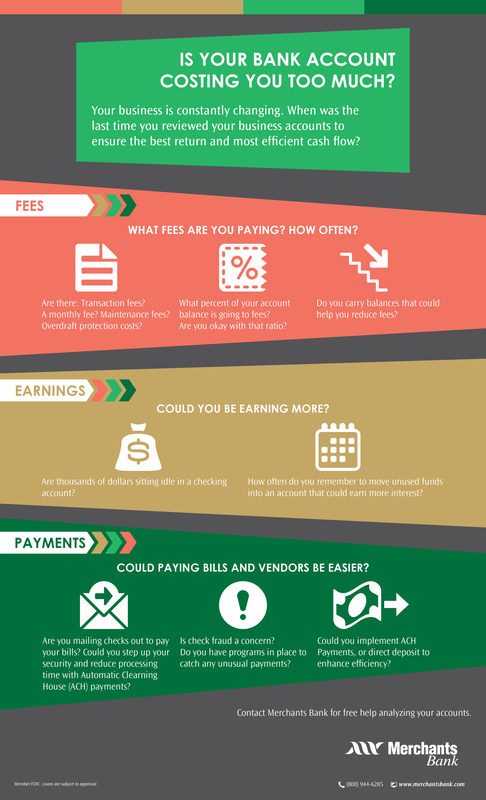 Want to share this infographic? Click to download. Mark McGrory has been with Merchants Bank for over 30 years and has served on our Executive Leadership Team for over 10 years. Throughout this time, Mark has helped many businesses evaluate their viability and learned a lot along the way. We asked him to share some of his expertise. What has your professional career path looked like? I started as a Commercial Banker in 1986. I helped customers work toward their business goals for 9 years, then I became the Commercial Banking Department Manager. In 2007, I became Chief Credit Officer. Over the years I’ve learned a lot about what may or may not work for different businesses in a variety of industries. What kind of professionals make up a strong team to help a business succeed? A business mentor – someone who is doing well on a large scale in your field, someone you trust to provide honest guidance, with your best interests at heart. Have you seen any risk trends in different industries? One of the big industries that affects communities large and small is commercial real estate. There’s been lengthy expansion in that area over the last 10 years. Some markets have become over-built, which may be starting to create a value bubble. This would certainly have a ripple effect in our local economies. What are some positive features you like to see from a business during the loan application process? When we’re evaluating a business’s risk level and deciding when to give them a loan, a lot of factors come into play. But very generally, we like to see a well-run, well-capitalized company; that income vs. debt are well balanced. Another aspect of a business we like to see is when a company is performing at a higher level than those in their peer group – that is, better than similar businesses in their field. It’s important to understand how what’s happening in your industry and economy will impact your business’s financial situation. Tips for managing a stable business? One of the best things you can do for your business is make sure your team consists of good people you can rely on. Business always starts with people, and a successful one never underestimates the impact of good employees and team members. Another thing to make sure you continue to work on is understanding the market you’re competing in – be aware of trends and what your customers are looking for. It’s a good idea to subscribe to industry newsletters and perhaps join an association or organization specific to your field. And finally, take calculated risks – make sure you weigh what you stand to gain vs. what you stand to lose – and when making those business decisions, always have a plan B in case your ideal situation doesn’t work out. Our commitment to community banking starts with our Executive Leadership Team. The Team pursues continued company success by focusing on our foundation of building community through banking and our Merchants Bank mission and core values . Our Executive Team works with our Regional Presidents, Market Presidents, Managers and all branch staff every day to ensure our customers come first. Watch our video series to get to know our Executive Team. Francis (center) pictured with his children and their spouses. We are proud to be locally owned. At our Annual Shareholder meeting this year, we asked our shareholders how they became part of the Merchants family. “My story with Merchants Bank is really my dad’s story that has been passed on to me. It is a story that started a very long time ago. Since he is no longer here to share it, I will do my best to tell it on his behalf. A life long businessman in Winona, there were times in building his business that my dad needed loans. When another Winona bank at which he had always banked did not grant his request, he went to Merchants Bank and there he found willing partners. It was the beginning of a very long relationship built on trust and mutual respect. A friendship developed with long ago Bank President Gil Grabow. After a round of golf in early June 1967, he convinced my father to purchase Merchants stock. My dad became a ready stockholder and never looked back. Over the years you could not find a more ardent supporter of the bank or a prouder stockholder. On two separate occasions, he gifted my husband and me with some of his Merchants stock. There was always a caveat with that gift –“don’t ever sell this stock without talking to me first”. Needless to say, we didn’t sell that stock because we understood that its value was much greater than the stated book value. My dad continued to invest and the bank stock continued to grow, splitting several times over the course of his ownership. As he neared the end of his life and was carefully planning his trust, he derived great pleasure in knowing he would be passing on stock in such a fine institution to my brother and me. My dad was a proud Minnesotan, and even prouder member of the Winona community, so it is no surprise that he took it quite personally that the very successful bank in which he had invested, had its origin in his hometown. -Karen Hawkinson, the daughter of Francis Zeches. During its annual meeting on Thursday, April 4, Merchants Financial Group, Inc. (MFGI) reported strong 2018 financial results, Shareholders re-elected two Directors and elected one new Director to the MFGI Board. MFGI formally reported net income of $18,887,308 for 2018. Pre-tax earnings were up 11.9% as compared to 2017. There was business growth on both sides of the Company’s balance sheet with year-end 2018 total deposits of $1.435 billion and total loans/leases of $1.424 billion. MFGI ended 2018 with $1.756 billion in consolidated assets, making Merchants the fifth largest banking organization chartered in the state of Minnesota. “Our Board of Directors helps ensure the Merchants organization stays true to our community banking roots while continuing to provide value to our shareholders. Their guidance, along with the hard work of our employees and the support of our customers and the communities we serve, is what helps us achieve steady business growth and consistently strong earnings performance year after year,” said Gregory M. Evans, MFGI President & Chief Executive Officer. Re-elected to three-year terms as Directors were: Scott K. Biesanz, Chairman of Goodson Manufacturing Company and James A. Trenda, Founder/Owner/President of CP Advisors, LLC. Elected as a new member of the Board of Directors to a three-year term was John H. Killen, President/CEO of Wincraft, Inc,. Killen has served on the Merchants Bank, N.A., Charter Board since April of 2018. At the meeting retiring MFGI Director Mike Cunningham was recognized for more than 10 years of service. Mike Cunningham, Partner of La Crescent Property Ventures, LLC and Former CEO/Owner of The Board Store Furniture and Home Improvements, will continue to serve on the Merchants Bank Charter Board and the Bank’s Local Advisory Boards for Onalaska/LaCrescent. Featured speakers during the meeting included Evans; Susan M. Savat, Chief Financial Officer; Wendy Cagle, Loan Review Officer; and Andrew Guzzo Regional President for Winona and the Southern half of the Company’s service footprint. Merchants Bank is a full service community bank with 21 branches in southeastern Minnesota and west-central Wisconsin. Headquartered in Winona, MN, the Bank has more than $1.75 billion in assets and was founded in 1875.